Updated: How much does a bathroom renovation cost in 2019? Whether you’re looking to spruce up your forever home, increase your rental return on an investment property or even top up the value of a property before you sell, then you’ll probably be considering a bathroom renovation. But first, before you undertake any work, you’ll want to understand how much a bathroom renovation costs. In 2018, the Housing Industry Association (HIA) released the kitchens and bathroom renovation report. Their survey found that the average value for a bathroom renovation was $17,522. This isn’t much more than the cost of a bathroom installation in a brand new home, which according to the HIA comes in at an average of $16,430. The average costs outlined above, however, can be really deceiving. How much your bathroom renovation is going to cost you comes down to many factors and variables, and because of this, the true cost of a bathroom renovation will fluctuate depending on your style, needs and circumstances. As a rule of thumb, a budget bathroom renovation in a small bathroom can be as low as $5000 while a major renovation in a larger bathroom can cost $25,000 or more. If you’re looking to change a few cosmetic things in your bathroom (like fixtures, drawer and cupboard knobs etc) before putting it on the market, it could cost even less. However, keep in mind that a bathroom renovation (along with kitchens) is one of the most effective ways to increase the value of your property. To find out how much a bathroom upgrade is going to cost you, you need to dig a little deeper. Let’s talk all things bathroom renovations and discuss some of the factors influencing cost below. What determines the cost of a bathroom renovation? The cost of floor tiles, wall tiles, fittings etc – are you going down a high end or budget route? The size of the bathroom – is it an ensuite or a large family bathroom? According to the 2017 Houzz Australia Bathroom Trends study, if you are between 35 and 54 years of age, you’ll spend about $12,700 on a bathroom renovation. The Houzz Australia 2017 Bathroom Trends Study also indicated some interesting data around bathroom renovation costs, with prices varying depending on factors like the size of the space and the age of the homeowner/s. Some interesting takeaways from the study are below. According to the study, small bathrooms that are less than five square metres in size cost an average of $9,700 to renovate. Renovating a bathroom that’s larger than this will come in at around $13,200. If you are over 54, the study indicates that you’ll spend around $11,900 on average. If you are between 35 and 54 years of age, you’ll spend about $12,700 on a bathroom renovation. If you’re under 35, the study indicates you’ll spend about $9,100. Bathroom style and fittings – how do they influence the cost of a bathroom renovation? Budget tiles cost anywhere from $30 to $55 per square meter (m2) while premium tiles can cost $165m2 or more. A budget bathtub costs around $300 to $500 dollars and will usually be acrylic. A premium bathtub can cost as much as $3000 – $8000 and a mid-range tub might cost $1000 – $3000. Keep in mind that you will be paying extra for installation. According to the Home Design Directory, a basic toilet costs about $120. A standard toilet costs about $400. A premium toilet costs up to $1200. A vanity costs $120 to $200 for a budget vanity, $700 – $850 for a standard vanity and $1500 or more for a premium vanity. Cost differences will vary for other fittings such as shower screens, basins, taps, exhaust fans, bathroom lighting, towel rails, tapware and more. For this reason, it’s important to do your research to make sure you’re finding the best deal for you. While some fittings might be out of your budget, with enough digging around you should be able to find something at a reasonable price point, so always remember to shop around. What tradespeople will I need for a bathroom renovation? With the exception of those who are super handy on the tools (or those performing small DIY changes), you’re probably going to need some trades for your bathroom renovation. Just like fittings, what trades will end up costing you will vary depending on what you need done, the size and accessibility of the space and even your location. It’s no secret that trades in capital cities and metropolitan areas tend to cost more per hour or per project than trades services in regional areas. Before jumping into cost, you’ll want to understand what trades you might need. We’ve included a list below, chances are there might be a few you haven’t factored in yet. For a typical bathroom makeover you’ll need a tiler, plumber, electrician, carpenter and maybe a handyman to handle demolitions or other odd jobs. Plumbers will be needed for moving or adding plumbing and can also do bath, shower and toilet installations etc. An electrician may be needed if you are installing new lighting, underfloor heating, exhaust fans, heated towel rails and hot water heaters. A tiler will be needed for waterproofing and wall and floor tiling. You need to keep in mind that it’s currently a legal requirement to have a licensed tiler to install waterproofing, so make sure you adhere to the legislation in your region. You may need a carpenter for bespoke bathroom cabinetry or shelving. You might need a bathroom designer for more upmarket designs. You may need a painter for re-painting walls, doors, and ceilings. The first thing you should do when you find a tradesmen you’re interested in hiring is check that they have a current license on Licence Hero, or check with your state or local government authority. For example, in New South Wales you can use Service NSW to check a tradeperson’s license. How much do bathroom renovation trades cost? Tradies will charge different rates for different services, but can also charge in different ways. For example, some tradies will charge an hourly rate, while others will charge per job, if they’re a tiler, they may charge per square metre. As mentioned earlier, it’s important to understand that how much a tradie will charge will depend on job complexity, location and accessibility as well. There’s a reason why word of mouth is ‘a thing’ – so if you’re looking for a good tradie, your best bet is to start by asking friends, colleagues, acquaintances and family members for their recommendations. This way you’re more likely to get a tradie who provides quality workmanship, is easy to work with and displays a sense of integrity. The last thing you’ll want to encounter is sloppy handiwork and bad work ethic. Try and get more than one recommendation from your network so you can find the right tradie for you. Failing this approach, you could also ask tradies you’ve used in the past for their recommendations. Tradies usually work in networks and will often be working on the same projects together. Chances are if you’ve used a fantastic plumber in the past, he’ll know of a great local painter or tiler who can assist you with your bathroom renovation. You can also look online, but always make sure that any tradie you find who hasn’t been recommended to you is put through your own online background check. Find out if they have a license and look online for reviews. You can also ask any prospective tradie for testimonials and examples of past work. At the very least, you’ll want to get three quotes. This way you’ll get a good idea of how much your bathroom renovation should truly be costing you. If quotes are all at a similar level, you can be fairly sure that the tradies you’ve selected are not taking you for a ride. How can you renovate a bathroom on a budget? If your bathroom is begging for an upgrade but you’re on a tight budget, there are a few things you can do to keep the costs down. First, you should think about how much you can get away with not changing. Some bathrooms will look really good with the simple additions of a new shower screen, tapware and a lick of paint. Other bathrooms will require a complete overhaul. There are a few DIY jobs you can do to trim your costs, like adding in new tapware, adding shelving and painting ceilings and walls. If you can’t afford to re-tile your bathroom, you could also consider options like, tile resurfacing, tile painting or even putting overlays directly over existing tiles. Generally if you want to keep costs down, then you should also try to avoid giving unnecessary work to tradies. For example, plumbing costs can be significantly reduced if you keep existing plumbing outlets where they are and don’t try and move anything. Bear in mind, you’ll still need a professional waterproofer because of legal requirements. Similarly, by law, only licensed plumbers and electricians can install electrical connections. How much should you spend on a bathroom renovation if you’re selling your home? If you’re renovating to sell, your bathroom will be one of your important selling points. However, it is easy to spend more or less on your bathroom renovation than you need to. What you need to think about is the value of your home and what buyers will want to see. In most mid-range homes, they won’t expect to see a bathroom that dazzles them with luxury high-end tiles and fittings. Have your tiles cleaned and regrouted to give them a new lease on life. Possibly have your tub and basin resurfaced (this should be done by professionals). Paint your walls in a light and fresh hue. Paint your vanity and replace the handles. Modernise your light fittings and tapware. Replace your shower enclosure with a more modern shower enclosure. These budget renovations can cost under $5000, but add far more than their cost to the value of your home. If your bathroom is in decent condition, you can save even more by doing DIY renovations. For some tips, read up on how to best stage your bathroom when selling your house. How much should you spend on a bathroom renovation if you’re selling an upmarket home? If you’re selling an older home in a more expensive suburb, you may need to do more extensive bathroom renovations, because in an upmarket home, buyers are expecting a certain level of style and quality. For this reason, you’ll want a considered bathroom design that utilises quality fittings. Your real estate agent can help you with your decision. They will know how much value a new bathroom can add to your home and give you some tips around what buyers in your locality would be looking for. You may not need to do a premium bathroom renovation, but some renovations can add value to your home. Before you start, you’ll want to make sure you have a plan. Do your research and ensure that any trades you need are hired in a systemic manner – this means you should have an idea of when you’ll need a plumber, when you’ll need a waterproofer, when you’ll need a cabinet maker and so on. When you start speaking to tradies and bathroom designers about your project, ask them for their advice and recommendations when it comes to setting up your renovation roadmap and timeline. If you have an overarching idea of how long each job will realistically take, your project will run a lot more smoothly. If you’re looking for flooring that is easy to maintain.. If you’re after the kind of flooring that is easy to look after, opt for porcelain or glazed tiling options. Avoid porous materials like natural stone and limestone. If they aren’t properly sealed, they’ll absorb every substance under the sun and end up becoming stained and unsightly. If you’re undertaking a bathroom renovation in a home with young children or people with mobility issues it’ll be important to invest in non-slip flooring. Choose tiling with textured surfaces, matte finishes and glazes that contain sand. This will help to create a bit more ‘grip’ when walking across their surface. Another option is to go for smaller tiles with plenty of grout lines. Moisture is your bathroom’s worst enemy. Doesn’t sound right, does it? But if you want to avoid stains, mould and unsightly mildew, you’ll want to make sure that whoever you hire to take on your bathroom renovation pays attention to air flow. Make sure that your vent fan is working, and that it’s the appropriate size for the space. As a general rule, you want to do renovations that will add twice their cost to the value of your home. If you go overboard on your renovations, you may be spending too much and may put buyers off. 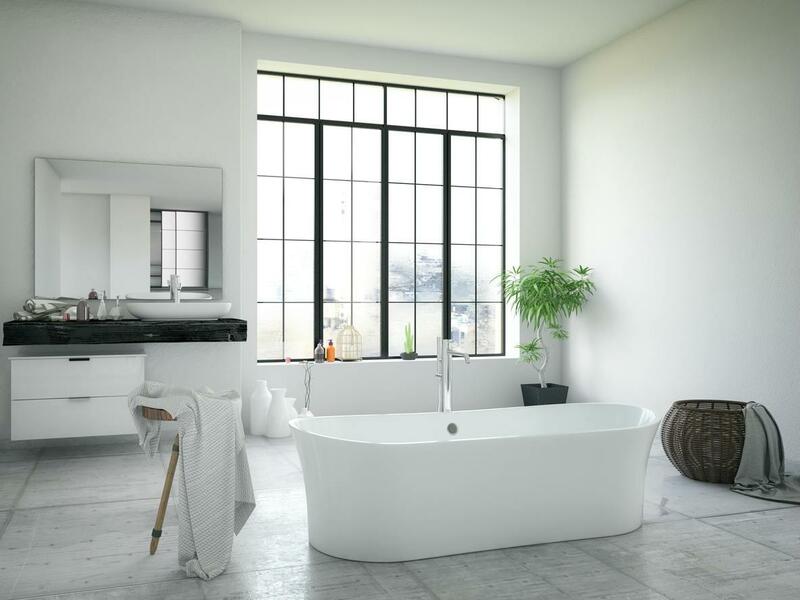 Some buyers may not want that $3,000 freestanding bathtub in the middle of the room. If you’re stuck for ideas, a real-estate home stylist or interior designer may be able to tell you what needs to be renovated in your bathroom. A good home stylist or interior designer knows the local market and can help you design a bathroom that will appeal to the widest possible market without making you overspend.